Grab your passport and pack your bags because the Peanuts gang is going on their first international jaunt in BON VOYAGE, CHARLIE BROWN (AND DON’T COME BACK!! ), arriving on DVD for the first time ever October 6, 2015 from Paramount Home Media Distribution. Released theatrically in 1980, and celebrating its 35th anniversary this year, this charming movie was the fourth feature-length film made with Charles Schulz’s beloved Peanuts characters and was a product of the long-time collaboration between Schulz, animation director Bill Melendez and producer Lee Mendelson. Together, these three helped create all of the Peanuts animated television specials and feature films, starting with A Charlie Brown Christmas in 1969. 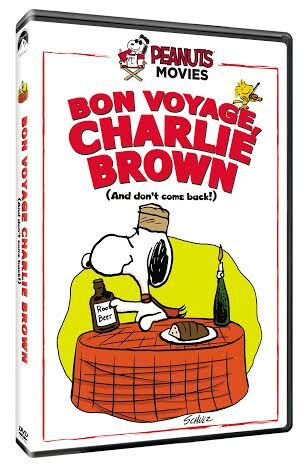 The BON VOYAGE, CHARLIE BROWN (AND DON’T COME BACK!!) DVD includes the classic film digitally remastered in 4K, along with a brand new featurette that gives fans insight into the creative process of animating the beloved comic strip, how the feature film came to be and what it took to bring the movie to the big screen. The featurette includes new interviews with Charles Schulz’s widow, Jean, at the Charles M. Schulz Museum in Santa Rosa, California, producer Lee Mendelson and Steve Melendez, son of Bill Melendez and president of Bill Melendez Productions. In BON VOYAGE, CHARLIE BROWN (AND DON’T COME BACK!!) Charlie Brown, Linus, Peppermint Patty and Marcie are chosen as – you guessed it! – exchange students, destined to spend two weeks in France. Of course, Snoopy and Woodstock join the French odyssey, which turns out to be a combination of mystery, intrigue, and romance coupled with the usual misadventures that seem to follow Charlie Brown wherever he goes!